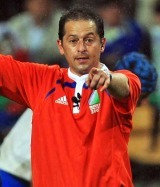 Jonathan Kaplan is Test match rugby's most experienced referee and was the first to reach the milestone of officiating 50 matches. Born in Durban, he started from an early age, first taking charge of a match in 1984 aged just 17 while a scholar at St. David Linksfield High School in Johannesburg. He quickly moved through the domestic ranks and went on to make his full Test debut in 1996 as he oversaw Namibia beating Zimbabwe 19-18 in Harare. He was a touch judge in the 1999 Rugby World Cup before going on to officiate in 2003 in Australia and in 2007 in France where he took charge of four Pool games and the semi-final between England and France in Paris. He made history when he took charge of the first ever match under the expanded Six Nations tournament as Italy took on Scotland in 2000. Other notable matches in charge include the second Test of the 2001 British and Irish Lions tour of Australia as well the third Test match of their 2005 tour of New Zealand. Scotland's clash against Ireland during the 2009 Six Nations Championship saw Kaplan become the first referee to take charge of 50 Test matches, a number which he has since surpassed. In 2009, SANZAR introduced a policy in the Super 14 in which referees would be selected on merit, that saw Kaplan go on to referee the Super 14 Final between the Bulls and the Chiefs. Under previous rules the fact that the Bulls hailed from South Africa would have precluded Kaplan from taking charge of the match. Kaplan had also previously refereed the 2005 and 2006 Finals of the competition, the latter between Crusaders and the Hurricanes was shrouded in low-lying fog that hindered the spectators and television cameras view of the match. In 2010, Kaplan completed his 17th Test in charge of the All Blacks, the most by any official with any team in the history of international rugby - eclipsing the mark of Welsh whistler Derek Bevan's 16 Tests with the All Blacks from 1986-99, a figure matched by New Zealander Paul Honiss with the Wallabies. His most memorable Test was his first involving the All Blacks, the Bledisloe Cup match in 2000 won 24-23 when Australian captain John Eales landed a last-minute penalty in Wellington. Kaplan had bottles and cans hurled at him as he left the ground, giving him an early taste of the criticism that is a constant companion for most top-level refs. In February 2013 he announced that he would retire from refereeing at the end of the 2013 South African season, after 21 years on the SARU's elite panel. Kaplan boasts a bachelor of social sciences in economics and psychology as well as a postgraduate degree in marketing management. He now lives in Cape Town.